Juvederm VOLLURE® XC (also known as Volift in Europe). is available at the Maloney Center located on Peachtree Dunwoody Dr. in Atlanta, Georgia. Juvederm VOLLURE is made by Allergan, the makers of Botox®, Juvederm®, Juvederm Voluma® and Juvederm Volbella®. This newest facial filler is designed to fill deep wrinkles while lasting much longer than their other fillers. In some patients it lasted 18 months or longer. This is the longest lasting result shown in a clinical study. This development was very exciting to Dr. Maloney who has many patients who have asked him for a filler that would last longer. He inject fillers into the nasolabial folds on a daily basis, and can now offer a filler that can provide results in the area for a longer time period. As with any cosmetic procedure, results can vary. View our current special offers on Juvederm VOLLURE® XC and Brilliant Distinctions®. 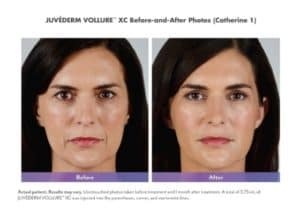 Juvéderm® Vollure® XC features the same Vycross technology that Juvéderm Voluma XC (the filler used to plump the cheek area) and Juvéderm® Volbella® XC (the filler used in lip augmentation) uses. 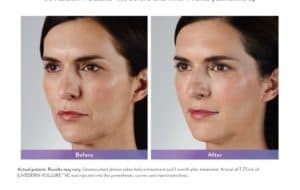 However, this time the Juvéderm® Vollure® XC is FDA-approved to use the Vycross technology in the nasolabial folds, which also happens to be the number-one dermal treatment area. Dr. Brian Maloney is one of the first doctors to offer JUVEDERM VOLLURE® XC in the United States and in Atlanta. Dr. Brian Maloney, Allergan National Trainer & Top 100 Provider, will be using this filler to smooth deep wrinkles for a refreshed look, as well as gently restoring natural-looking contours in the lower face. Why is this exciting new product effective and long lasting? JUVÉDERM VOLLURE® XC is formulated with Allergan’s proprietary VYCROSS® technology, which blends different molecular weights of hyaluronic acid. This versatile formulation yields both a gel firmness and fluidity that results in JUVÉDERM VOLLURE® XC lasting up to 18 months!